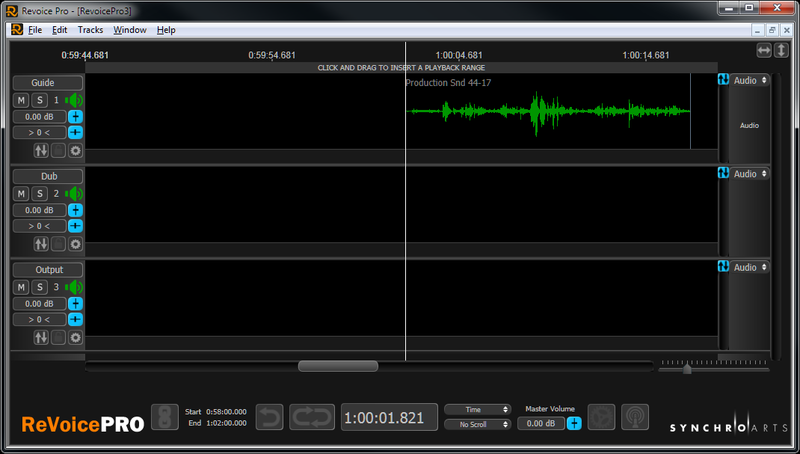 The most efficient way to transfer audio from Nuendo/Cubase to Revoice Pro is by using drag and drop. But if there isn't room in one computer screen to see multiple program windows, you can also Copy the audio in Nuendo/Cubase and Paste into a Revoice Pro track. For an APT process, you will need to transfer two input signals (a Guide and a Dub) to Revoice Pro. But for a Doubler or Warp process, you only need to one input signal. When copying the Guide and Dub audio, it doesn't normally matter which you do first, but you should name the tracks in Revoice Pro so you put the audio into the right tracks. Also, we advise transferring the longer of the Guide or Dub second, for reasons that will be explained below. 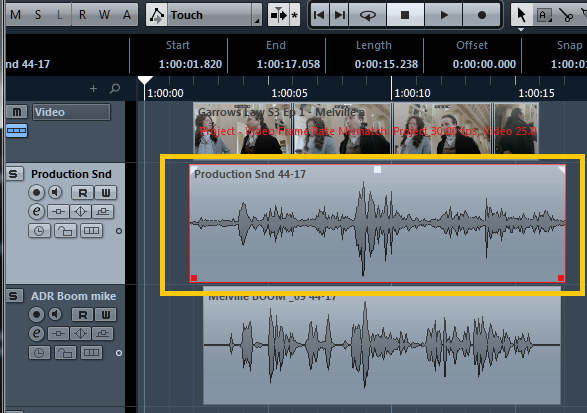 In Nuendo/Cubase select one or more audio clips in a single track that you want to transfer to Revoice Pro to process. We will show first transferring one Region from Nuendo to Revoice Pro and processing that. When transferring multiple regions from Nuendo to Revoice Pro, the regions will be transferred, but before processing, one extra action will be required which will be explained below. You can use any of the Nuendo selection commands including clicking on a single region, or use Shift+click to select multiple regions, or Shift+double click at the first event of the track to select all following events of the track. 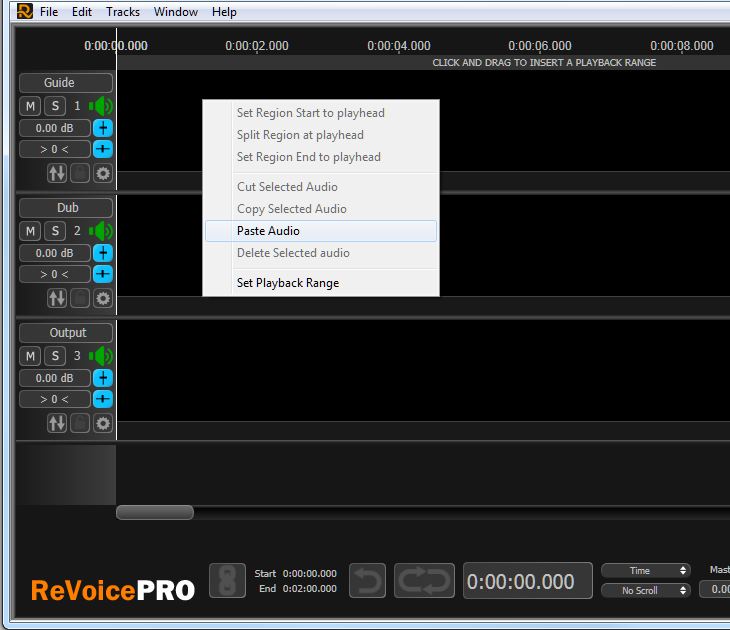 Transfer the audio to Revoice Pro: If you can see both the Nuendo and Revoice Pro windows, you can easily drag the selected region(s) from Nuendo to a Revoice Pro track and drop it by releasing the mouse button. Or, you can use the Copy command in Nuendo and then go to the Revoice Pro window, put the mouse over the destination track, right click and select the Paste Audio command shown below. If using an APT process, select the audio clip(s) in the Nuendo Project that are to be aligned (only in one track) as shown below. 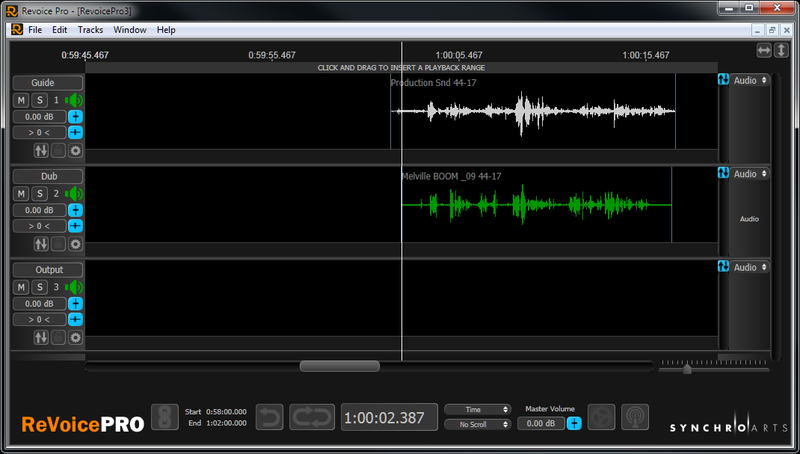 Drag & Drop (or Copy and Paste) the clip(s), to the next Revoice Pro track as shown below. The first audio region imported into a Revoice Pro Session window automatically sets the values of the Revoice Pro session's Audio Sample Rate and Audio Bit Depth settings. 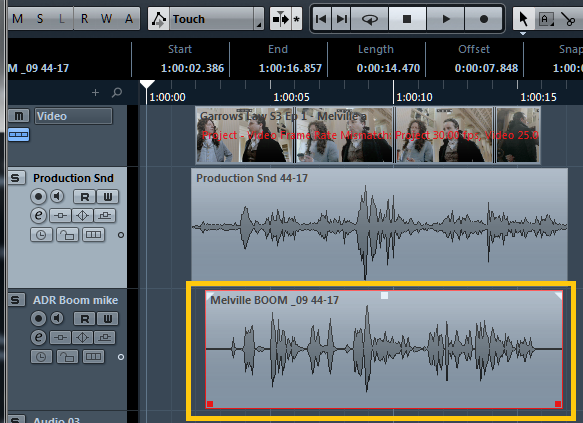 Revoice Pro Sessions require all audio regions to have the same Sample Rates and Bit Depths. If the audio regions are empty in Revoice Pro or at the wrong locations, check that you have set the correct DAW version and BPM rate. If you have transferred more than one region for the Guide or Dub, you should click here to read what additional operations you might need to take.